This beautiful Mycenaean Stirrup Jar is a great example of Early Greek antiques. A?Available through Phoenix Ancient Art with Ali Aboutaam and Hicham Aboutaam, this jar has a body that is highlighted with a carefully painted lozenge chain. A?The round profile is accentuated with the horizontal bands of lines. 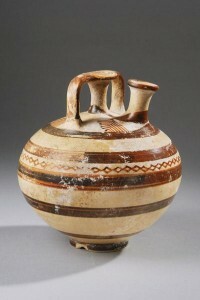 Jars of this sort were first produced in Crete at the end of the Middle Minoan Period from 1700-1550 B.C. A?This pottery type is quite unusual and has a false spout that is capped with a clay disk. A?While it looks like the liquid pours from here, it actually pours from a spout on the shoulder of the vase. This type of design was intended to create easy transport. A?The false spout made it easy to carry the jar, while the narrow neck where the actual spout is allowed the user to easily control the flow of liquid.